This is a round Alpha Portland Cement porcelain sign. This particular Alpha Portland Cement sign is predominantly navy with white text and touches of red. 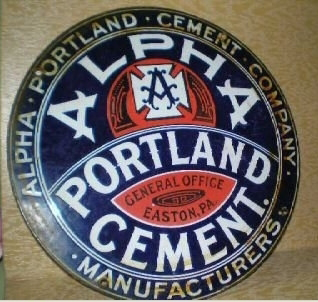 It reads, “Alpha Portland Cement Company, Alpha Portland Cement Manufacturers, General Office Easton, Pa.” and features a stylized “A” in the center.